Wow Sandra, what a great quilt. 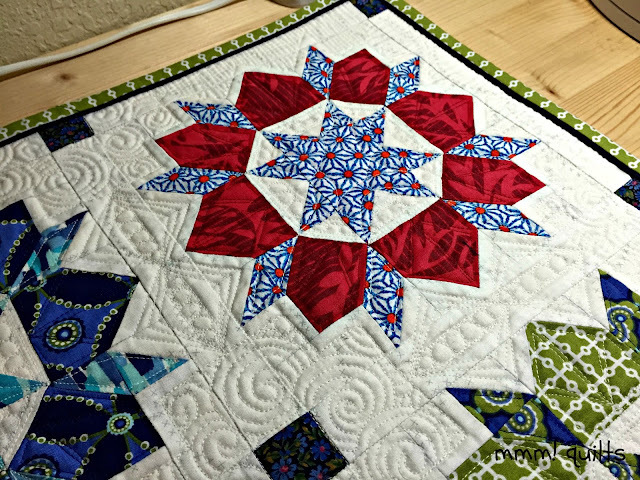 Fantastic choice to ignore the sashing, the quilting really brings it to life. Just fabulous! Uh, 65 pieces. . . this one might have just fallen of my list of quilts to make! 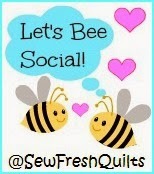 ;) Headed over to Tish and Cindy's to see their finishes! Beautiful Job, I just love how the layout makes the colors pop! 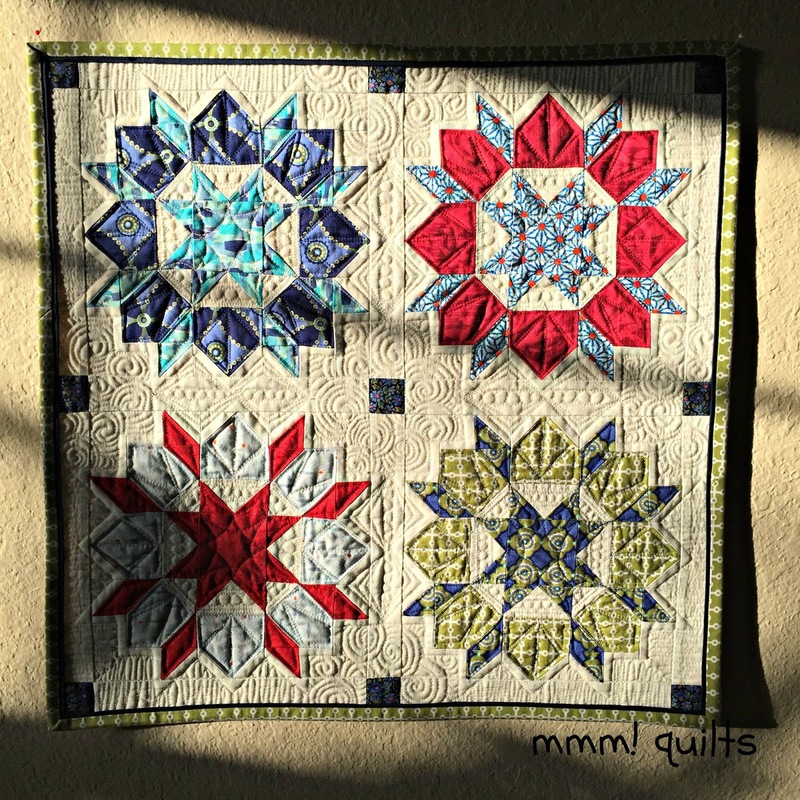 Great quilting too. All I can say is YES! YES! YES! This turned out over the moon beautiful! I loved the bold rich colors from the first time you pulled them. 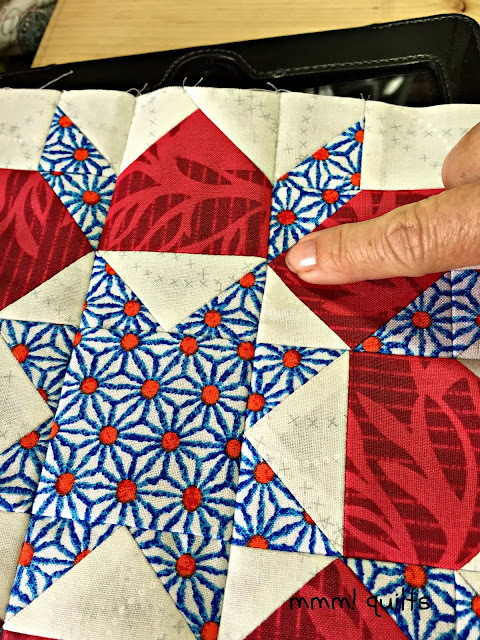 And the quilting, I could go on and on. I love how you made that background flow. Ignoring those sashings was 100% the way to go. I love how those L's pull your eye toward the swoons and swirls. Every thing is just spot on. I literally squealed when I saw the green and navy binding. 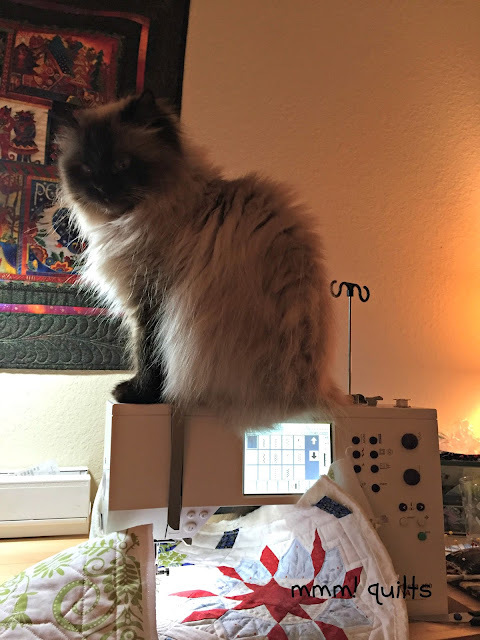 It frames it perfectly and demands attention. I feel like I'm trying to convert everyone over to the Susie's way of binding :) It's like a little cult, but a fun one and we will not drink "the cool aid"...just wine. And Miss Bella, she almost looks like she's in slave driver mode. "You WILL finish, my human! And rub my belly" She was determined to over see the finish of this quilt. Wow, Sandra! I didn't know a Swoon mini was on my bucket list, but it is now! That is just gorgeous! As I read along on your post, I started to laugh because I just finished a mini where I tried Susie's Magic Binding! I haven't posted about it yet, but plan to soon. It was fun to try something new and I do like how it looks for finishing off the quilt! It's awesome and congrats on getting your goal met! And a very nice job on the quilting with no longarm in sight-I'm impressed!! 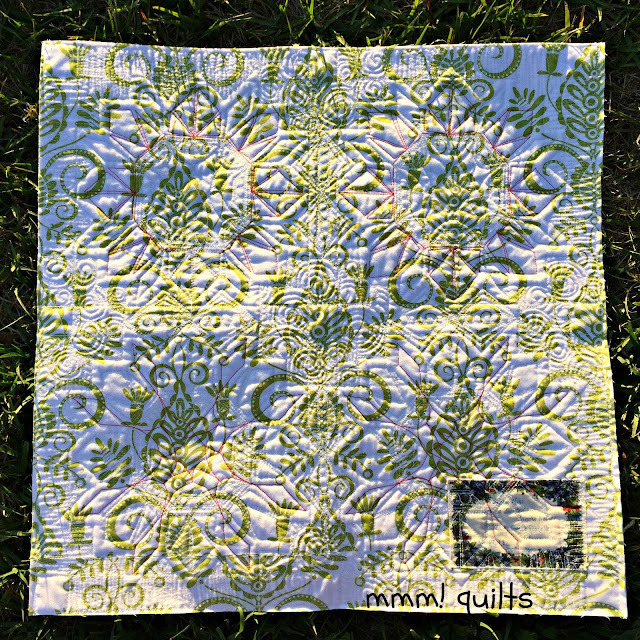 Wow, from your non quilting sister omg wow! 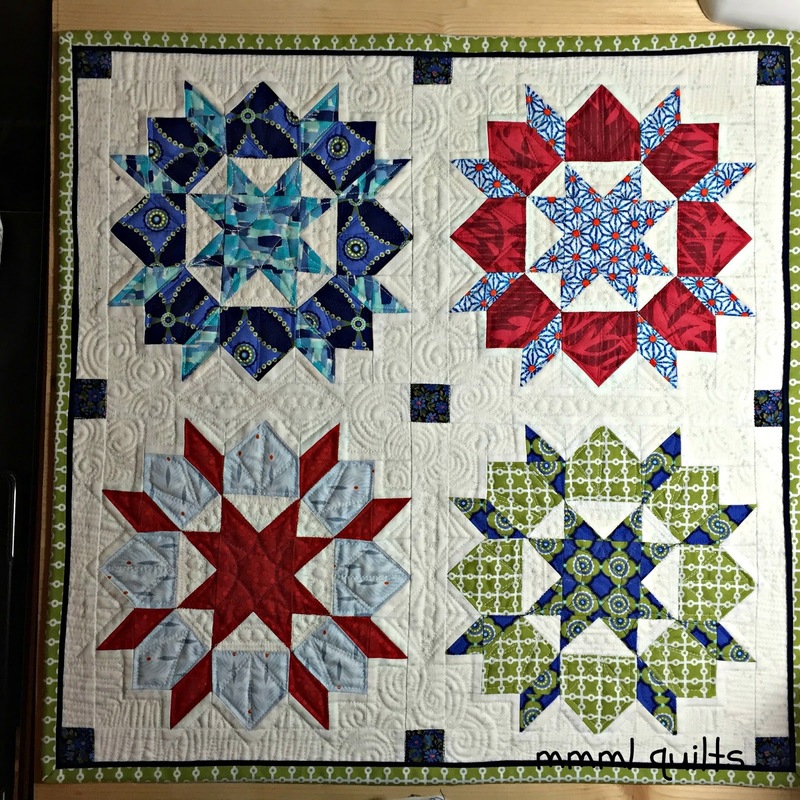 Very beautiful quilting, not that I am in any position to pass judgement lol. Who knew all those colours would meld so beautifully? It reminds me of a very old quilt, just the kind of subdued look of the colours. This is so cool and the quilting is seriously gorgeous. 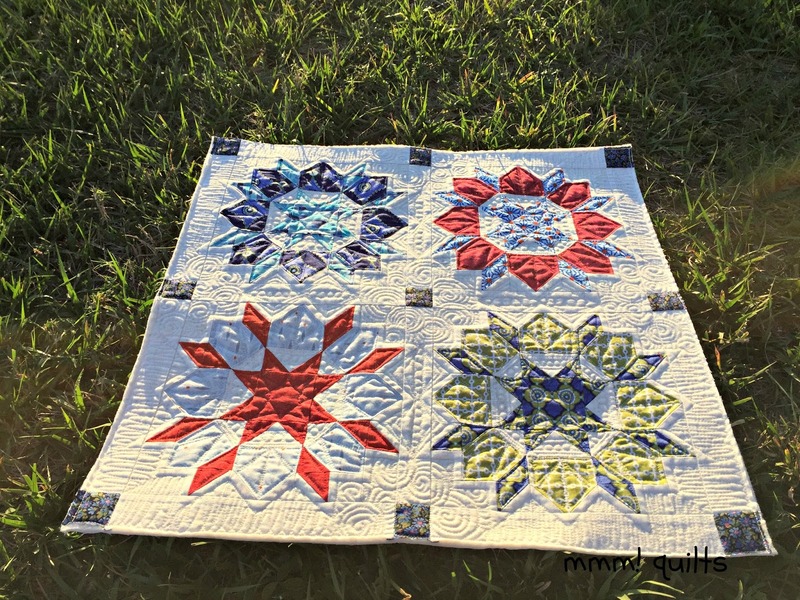 Beautiful little Swoon quilt!! Love the quilting too - fun to see the different quilting patterns linked up for this quilt this month!! I absolutely love the quilting...it puts mine to shame. Well done Sandra. I am so glad to have been apart of the swoon month. 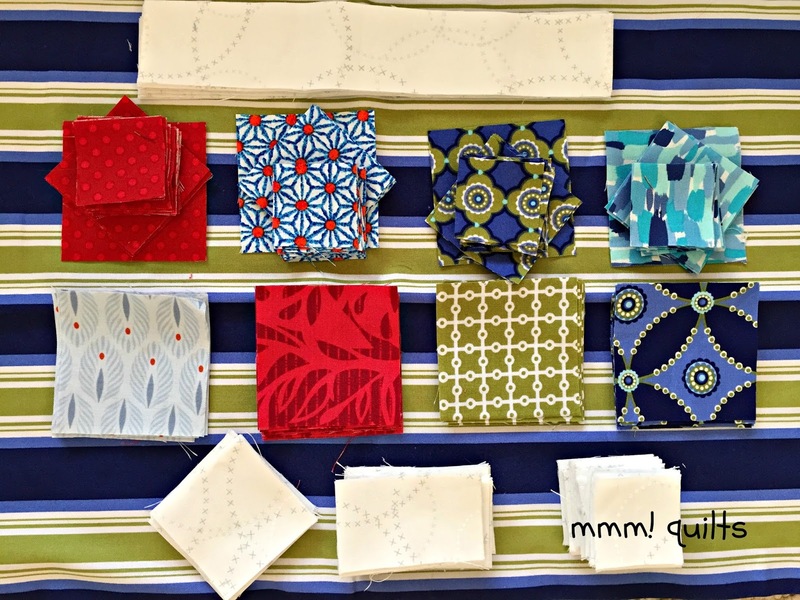 I really like the fabric you used in your mini Swoon Sandra. 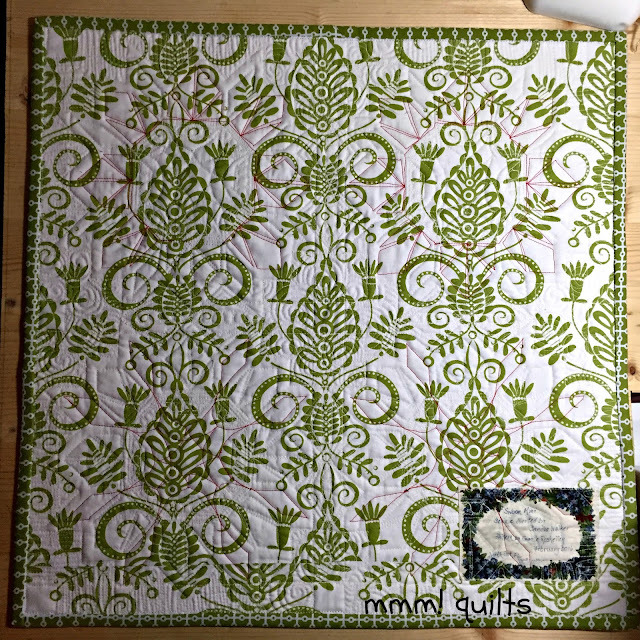 The quilting of course is amazing. Lovely finish and what great quilting. I love the swoon block but think I will stick to the larger size-11/2 inch pieces-No Thanks. How fun! I am working on my Swoon blocks this month too. But they are not as cute as yours! Yours turned out beautiful! I love your quilting and the binding is perfect. 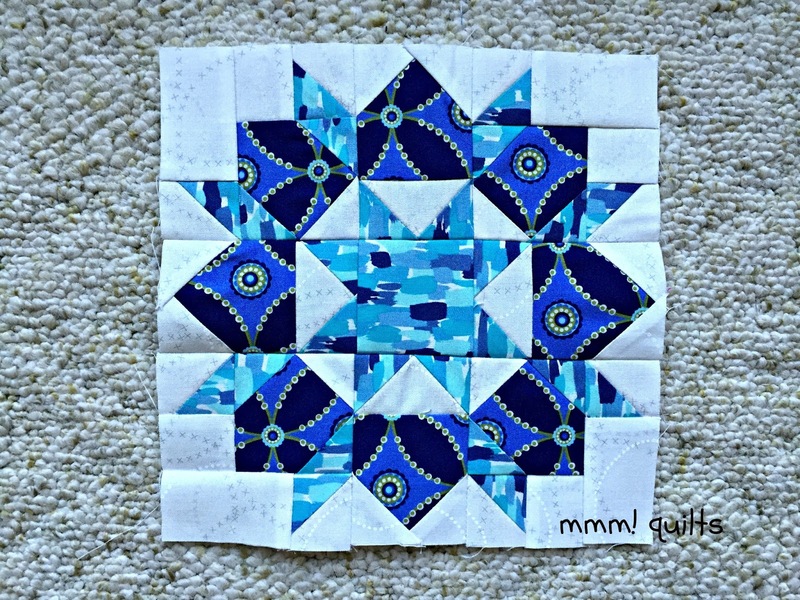 I've never made a mini swoon (or any swoon for that matter)! If I did, it would be the mini! How fun that the four of you took this challenge on together! That's what friends are for! Great job. I really like the quilting. Congrats! Awesome! 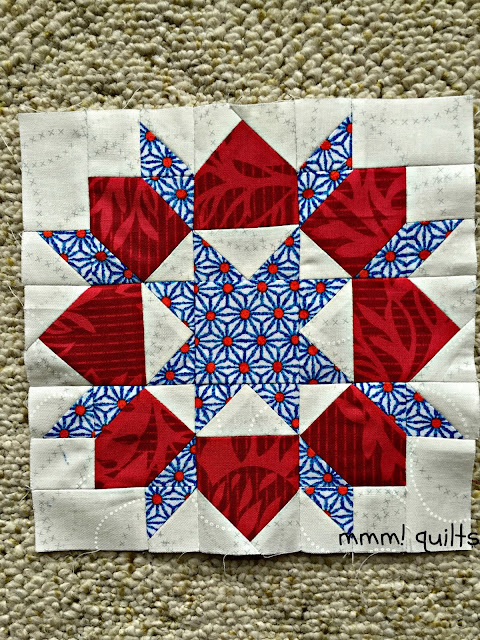 Love the detailed quilting on the smaller blocks. It's just beautiful, and very inspiring! 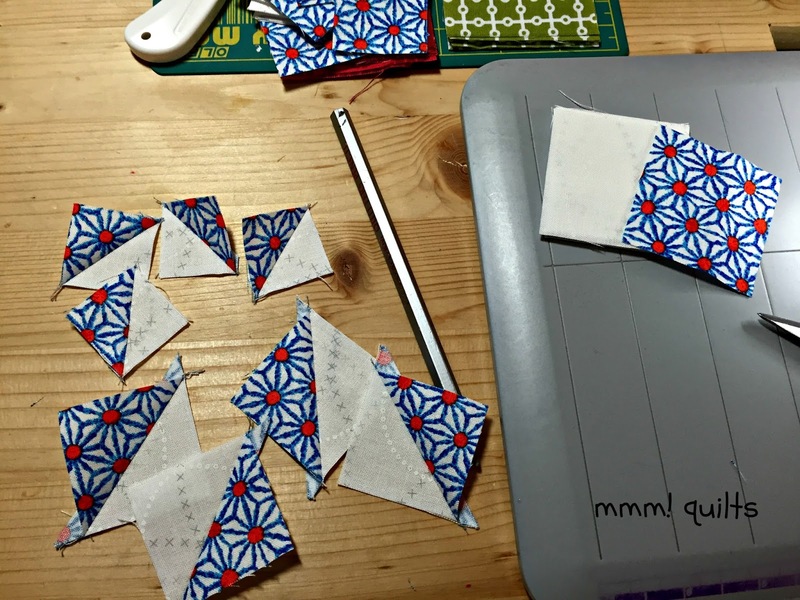 Super fun quilting--the backing is very cool too! 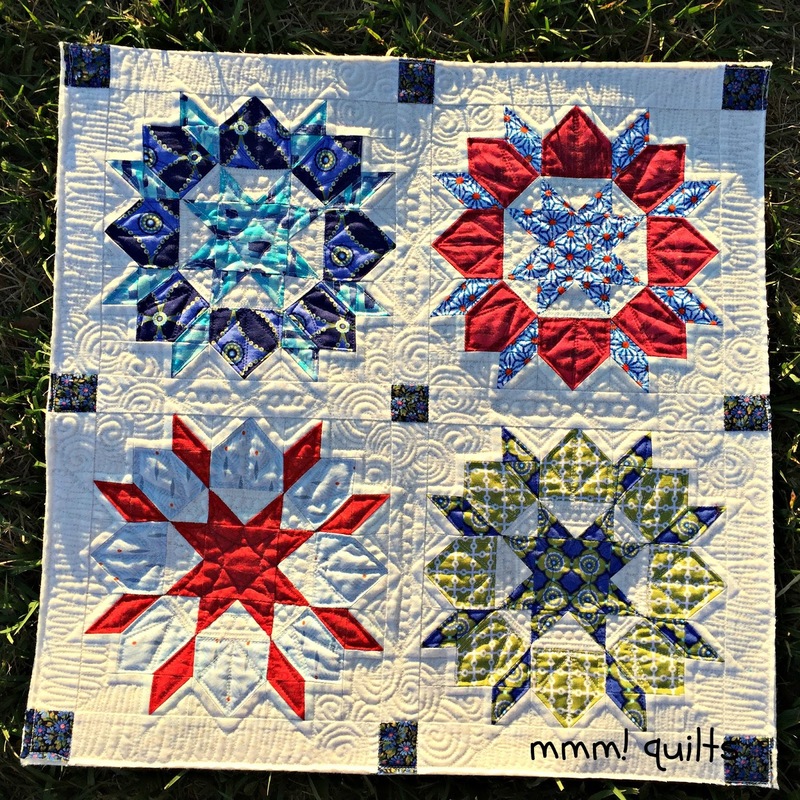 Beautiful mini and wonderful quilting!